A private and exclusive area of the Serengeti eco-system, teeming with wildlife throughout the year, but especially in June/July when the migrating herds must come face to face with the huge Nile crocodiles lying in wait for them. 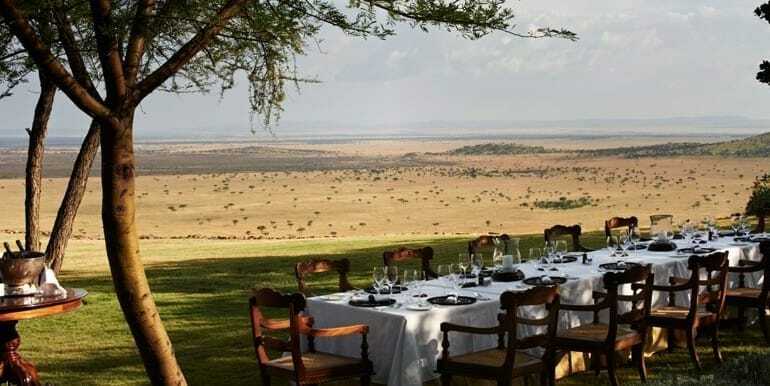 Nor is it difficult to find lions lurking on the plains….all you need do from one of Sasakwa’s sprawling patios is glance around with a pair of binoculars…the pale belly of a lion is bound to bask back at you! The Great Migration traditionally moves through the Grumeti Reserves and crosses the Grumeti River between June and August. These Grumeti river crossings are arguably amongst the top adrenalin-filled wildlife spectacles of the natural world – when the wildebeest must run the gauntlet of enormous Nile crocodiles lying in wait for them. However, when these spectacular scenes are teamed with a week-long stay at Singita Sasakwa Lodge, you get a pretty amazing combination of wildlife and romance and exclusivity that is hard to beat. How you choose to spend your days over the next 6 nights is entirely dependent on you. If you have come here during the migration, then you may choose to spend a lot of your time waiting to see the river crossings. Or you may decide to follow a coalition of cheetah as they band together for a hunt. You may decide to spend your time tracking leopards, or porcupine spoor. On the other hand, you may wish to head off on a champagne bush picnic, enjoy a lazy day at the spa or play a game of tennis. The possibilities are endless. What we can tell you is that combined with all the other sports and relaxation activities and gourmet meals available at the Lodge, your days here will be splendidly full. Singita Sasakwa has once again been voted as the top leisure hotel in the world, and we think that this incredible mix of wildlife and comfort makes it a fantastic candidate for special celebrations of all kinds. Recommended months: June-July for river crossings and the Tanzania Migration; year-round for masses of wildlife & a romantic safari vacation. Perfect for: Those looking to celebrate a special occasion or a honeymoon in an extraordinary and unforgettable setting – where the wildlife and accommodation are both of the highest quality. Activities: Bush walks, cultural visits with the Maasai, archery, lawn croquet, badminton, billiards, star-gazing safaris, mountain biking, equestrian pursuits, hot air ballooning, tennis, yoga, spa and gym facilities. Wildlife: All the well-known East African mammal species, including; 400 species of birds (including five endemic species and a high concentration of raptors), 40 species of herbivores, 25 species of large carnivores and prolific plant life and plant species. Last year, I celebrated a milestone birthday not far from these reserves and drank a celebratory gin & tonic amongst thousands upon thousands of wildebeest. It was an awe-inspiring sight and a deeply emotional moment for me. But even more awe-inspiring to me is the vision and philanthropy of one man – Paul Tudor Jones – who has single-handedly converted a poached out and hunted out area of the Serengeti into a wildlife paradise. The Grumeti Community and Wildlife Conservation Fund was formed in 2002: a non-profit organisation dedicated to community-based work, anti-poaching and development. The Grumeti Fund has established a number of schools and sustainable agricultural projects, and has brought much-needed borehole water to this part of the world. The Fund is involved in many other literacy and economic development projects as well. Before a sustainable commercial tourism venture could be established, the extensive poaching had to be managed and ultimately halted. An anti-poaching unit was established and proceeded to place the reserve under surveillance. After six years, the unit has had an unprecedented impact and poaching has become virtually unknown in the reserve. There is another part of the Serengeti eco-system on the eastern side of the park (Loliondo) that has become a playground for rich hunters who are seriously depleting wildlife in that area. My hope is that when you have visited the Grumeti Reserves, one of you will want to take over Loliondo and make of Serengeti’s eastern arm what Mr. Tudor-Jones has made of its western arm. This fly-in safari will take you directly to Singita Sasakwa Lodge from Arusha.